Jhanei and Marcus originally met when they were younger, but reconnected later in life during a business happy-hour. Marcus would propose to her at a local Red Lobster, her entire family in on it and there for the surprise. She was so happy she cried. They decided on a destination wedding after researching local weddings and how much they would cost. 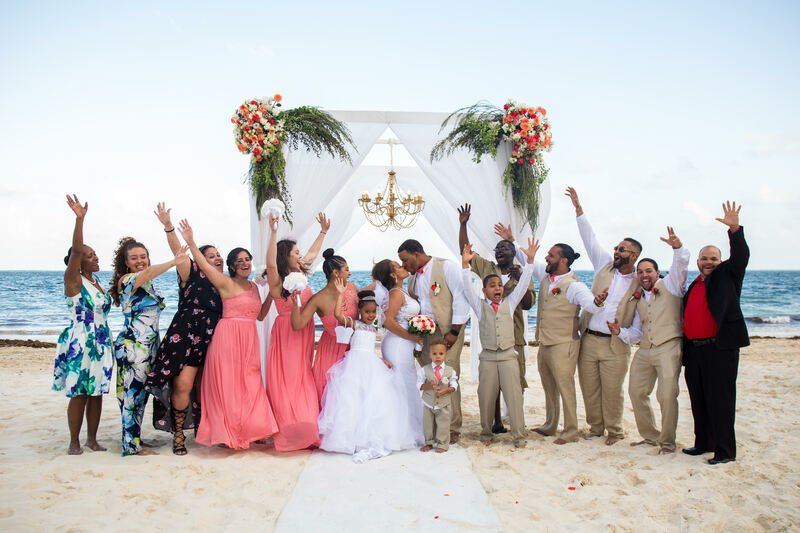 After getting a quote of around $35,000 with the cost of catering and pictures included they knew a destination wedding would be the way to go. After looking up several destination wedding companies online, Janei ended up requesting an inquiry from Destify. With her newfound agent Ann, they were able to learn about several destinations and resorts. Jhanei knew she wanted a resort where everyone could be happy, from the adults to her three children; Jordan, Jaydaliese, and Jacobo. Ann suggested several resorts and the couple chose the Dreams Riviera Cancun in beautiful Mexico. It was the perfect resort for their budget and time of the year. Jhanei said communication was initially slow with the resort’s wedding department which made her nervous, but that changed after her agent called them. Once on-site they met with their coordinator 2 days before the ceremony and finished last minute details. The couple opted for some additional decor, including alternate colors and a chandelier. Most of the group stayed between 3 – 4 days and the couple stayed a week. They held a practice ceremony the day before, and held their true ceremony on Valentine’s day, at a beautiful 5pm sunset ceremony. In Marcus’ vows he mentioned how important the date was, it was his mom’s birthday too and she meant the world to him. Marcus said, “By having their wedding on that date it meant she was holding her place”. Afterward, the couple took advantage of Dreams’ amenities. The kids were tired of being with the adults so they were taken care of by the resort’s Explorer’s Club, which was hosting a smores night, while the adults went to dinner. The newlyweds hosted their semi-private dinner reception at the resort’s hibachi restaurant. Jhanei recommends anyone choose a destination wedding. The couple agreed that by hosting a destination wedding you cut down on bringing only the most exclusive loved ones and friends, not to mention costs too. There isn’t any of the stress that is involved from having a local wedding. You spend so much more money on a wedding at home where you already go through so much stress anyway, with this you get a vacation.